The basal ganglia are a group of nuclei in the brain, and any serious damage in this area can have serious effects on a person’s movement, perception, and judgment. The brain has many parts working to control our thoughts, actions, and responses. The basal ganglia play an important role because they act as messengers, sending signals throughout the nervous system. A basal ganglia stroke can lead to problems with muscle control, vision, swallowing, sense of touch, and even cause personality changes. Although the basal ganglia are a part of our motor system, research indicates they work in conjunction with the path that conducts signals for action along nerve tracts that trail from the cerebral cortex (largest part of the brain, located right under the forehead) to motor neurons that activate skeletal muscles. This means that they have a significant job in making sure the right motor function is communicated to our muscles. A lot of information collected about the role of basal ganglia has been the result of research into disorders that lead to difficulty initiating movements, as is the case with Parkinson’s disease or suppressing unwanted movements, as seen in Huntington’s disease. What causes basal ganglia stroke? There are a number of potential basal ganglia stroke causes. Brain injury is the main cause, but it can also happen due to copper poisoning, infection, tumors, or multiple sclerosis. There are certain brain disorders, including Huntington’s disease, Parkinson’s disease, Wilson’s disease, multiple atrophy, and dystonia that can lead to a basal ganglia stroke. There are rare situations where severe hypertension and reduced supply of oxygen to the brain can cause a stroke. Many of the strokes that take place in the basal ganglia are hemorrhagic strokes, which means an artery in a part of the brain has ruptured. Blood vessels in the basal ganglia are small and vulnerable to tearing and rupturing. An ischemic stroke can also affect the basal ganglia. This type of stroke takes place when a blood clot or narrowed arteries prevent proper blood flow through the blood vessels. People are at a higher risk of hemorrhagic stroke in the basal ganglia if they smoke, have diabetes, or have high blood pressure. These same factors can increase the risk of an ischemic stroke. Research suggests that close to 80 percent of basal ganglia strokes can be prevented by reducing risk factors, following a healthy diet, and not smoking. What are the symptoms of basal ganglia stroke? Some of the symptoms of basal ganglia stroke are similar to symptoms of stroke that occur in other areas of the brain. Those symptoms include a sudden or an intense headache, numbness or weakness on one side of the face or body, a lack of balance, difficulty speaking, and difficulty seeing. There are other basil ganglia symptoms depending on which side of the body the stroke affects. For example, if the stroke occurs on the right side of the basal ganglia, a person may have a hard time turning to the left. Some people who experience right side basil ganglia stroke are not even aware of things happening on their left. Someone who has a stroke on the right side of their basil ganglia may experience severe confusion and apathy. It is also worth noting that some people experience ataxia, but it may not necessarily mean they have suffered a stroke. Ataxia—which is a lack of muscle coordination impacting everything from walking and picking up objects to eye movement, speaking, and swallowing—can also be caused by head trauma, autoimmune diseases, infections, or toxins. Basal ganglia stroke recovery often depends on how quickly a person seeks medical attention when their symptoms first occur. The sooner you get to a hospital, the more likely doctors will be able to help you minimize the damage. If you have suffered a hemorrhagic stroke, the doctor may fit a tiny clip onto the opening artery or perform surgery if the rupture is significant. If it is an ischemic stroke and you get to the hospital quickly, you might be a good candidate for clot-busting drugs. Most stroke patients participate in rehabilitation routines. For instance, if the stroke has had an impact on your balance, specialists can help teach you exercises so you can learn to walk safely again. Those who have emotional challenges, such as anxiety and depression, can take advantage of mental health services. Sometimes recovery means learning new skills in order to replace old ones that were lost and teaching areas of the brain to take over the work of any damaged areas. Rehabilitation can take time. For some people, it could be weeks, while others find that it takes several months to see any results. People who suffer a basal ganglia stroke rely on both a supportive medical team as well as family and friends to get them through what is likely the most difficult time in their lives. It is really remarkable how the brain can recover from a serious condition, such as a stroke. There are many cases where people recover from brain injury, but there are also situations where a full recovery isn’t possible. 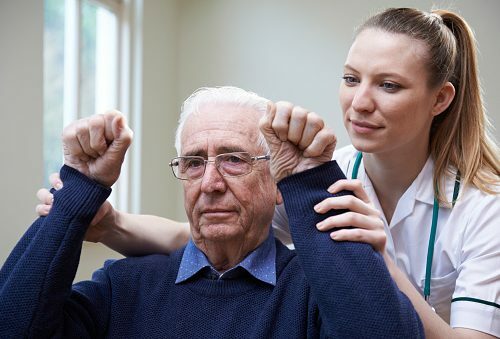 Basal ganglia stroke can have long-lasting effects and research suggests that it increases the risk of developing Parkinson’s disease. However, those who stick with a rehabilitation program and take full advantage of all the services in their community have a much better chance at improving.